The course comes with 27 video lessons with step-by-step instructions and many exercises and sheet music. 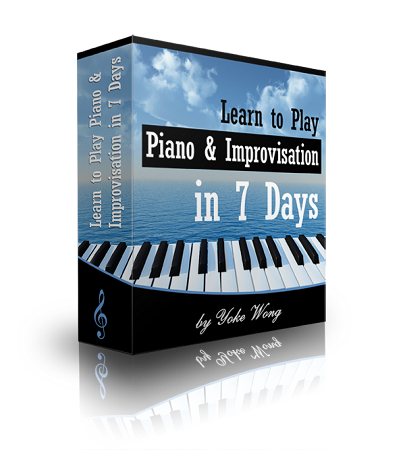 It is suitable for beginners and those who want to learn piano improvisation easily. Piano Chords & Progressions 1 - What Is Piano Chord? Bonus: "A Practical Guide To Piano Chords & Chord Progression Ebook (26-page)"
As a mature person I am enjoying your program so much. It is comprehensible, enjoyable and challenging and importantly I can work at my own pace. I look forward to proressing and subscribing to additional programs. I am not a beginner and have been learning to play the piano intermittently for many years but I am so glad that I purchased this beginners course. The instructions are very clear and easy to follow. The printout is invaluable for revision. I am now able to understand the left hand notes on the sheet music and able to play with different chord progressions and beats with confidence. Having a lot of fun with 'Greensleeves'. Downloading to my iPad has been easy. Great course. Hi Ms Wong ,Thank you for your interest on my Piano lessons . I can say I am doing okay for now and spending more time on the notes above the stave and the notes below the staves and also the Chords and the timing which is so important.When I am finished I would of covered everything. you are a good Tutor and I am very grateful to have you as my Tutor. And I am thanking you very much. May God bless you.